Deepest oil well in Gulf IS LEAKING!!! The Transocean Deepwater Horizon rig 130 miles South East of New Orleans exploded on April 22, 2010 and is now submerged and resting 1,300 feet from the well site on the seabed  . The oil leak was discovered Saturday, four days after a explosion and fire. Eleven people of 126 aboard the rig are missing and presumed dead. It is now gushing 42,000 gallons of oil day, about 5,000 feet below the oceans surface . The oil slick is now 600 square miles (1,550 square kilometers),on the surface planes already dropped 7,715 gallons of chemical dispersant and has 100,000 gallons of dispersant ready to be deployed or one third the world’s commodity . There are 32 spill response vessels and 1,000 workers trying to clean the oil slick and as of April 25, 48,324 gallons of oily water had been collected by surface skimmers . BP is currently engineering a system that is shaped like a funnel or large dome that will be lowered underwater to collect the oil that is rising to the surface. This is a new technology that has only been used in shallow waters after Hurricane Katrina and it is not positively going to work because has not been used at such great depths. . “There are currently 4 remote controlled submarines trying to pump fluids into a 450-ton blowout preventer to shut a valve that would close off the well”, according to Doug Suttles, BP’s chief operating officer for exploration and production . If shutting off the valve does not work then BP will try to start drilling a relief well as soon as possible. This would allow other work to permanently seal the well later. With recent projected increased offshore drilling  , how many more oil spills or oil accidents will occur? Although according to a study done by Texas A&M University, the amount of oil split in 2000’s vs. 90’s, 80’s and 70’s has dropped significantly, with deeper exploration will there be more environmental damage to come? What is Combustible Ice? Combustible Ice is also known as Methane Gas Hydrate, or Methane Clathrate, or fire ice. It is a clathrate compound which is formed from water molecules under high pressure and low temperatures. These water molecules form an ice like cage that encapsulates a gas molecule, in this case, methane . China’s western Qinghai provincial governor Luo Huining said on March 6th 2010, that they will see increased explorations for the emerging “combustible ice” clean energy. The Qinghai Porvince recently found in September 2009, that it is sitting on a quarter of the Qinghai-Tibet Plateau reserve. This reserve is estimated to equal at least 35 billion tones of oil which could supply energy to China for the next 90 years . China plans to spend $100 million in the next 10 years on research for Methane Hydrate. The total resources for combustible ice were estimated to be twice as large as the total coal, oil and natural gas reserves in the world . But according to a study done by BP exploration, the current Methane hydrate reserve is less than the total coal and oil reserve together, but more than the natural gas reserve . According to a study done by USGS, it is an estimated more than 1,300 trillion cubic feet of methane gas is off of North and South Carolina coasts in the form of Methane hydrate . So what makes this combustible so special? Approximately one cubic meter of “combustible ice” equals 164 cubic meters of regular natural gas . It is considered a cleaner energy because when burned, it only puts off water and CO2. It does not have any SOx or NOx emissions. Since the gas is held in crystalline structure, it is a lot denser than typical methane gas. 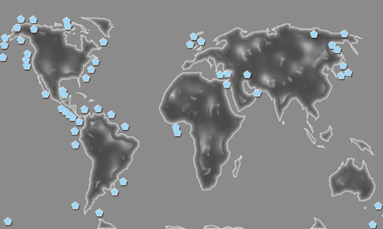 Also, methane clathrates are stable at a higher temperature (−20 vs −162 °C) than LNG, there might be some interest in converting natural gas into clathrates rather than liquefying it when transporting. But this “emerging energy source” can come at a cost. Right now it is not economical to extract and too expensive, about 8 times compared to the natural gas in China today (1$ per cbm compared to 0,125 $ per cbm). 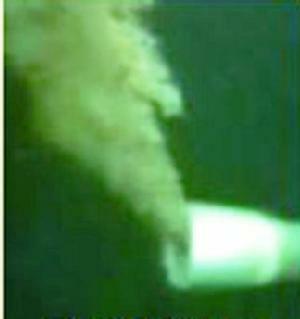 The extraction and mining of the combustible ice can be environmental damaging as well. When burned, it still would be releasing CO2 into the atmosphere which is not really solving the greenhouse gas situation. If not handled properly, when brought to the surface, the methane escapes from the “ice” and if not burned goes into the atmosphere. This is not good because methane is much more potent as a green house gas goes than CO2 and can cause more damage than CO2. Then again look at nuclear energy, it has environmental harmful nuclear waste, but we use it as a clean energy today. 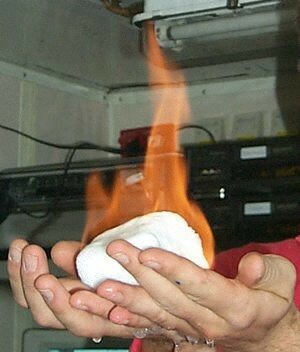 So with more research to be done, this CombustibleIce could be used as a source of energy in the near future. Why do we fear smart meters but love credit cards? An Effective Reverse Energy Weapon? Energy, Technology, & Policy · Writing at the intersection of engineering, science and public policy for the world's energy challenges.